An accession is made up of materials physically and legally transferred to a repository as a unit, which will be processed by staff and added to the institutions’ holdings. In AtoM, an accession implies the first deposit of materials - accessions added to an existing fonds or collection are known as accruals. To accession something is to take legal and physical custody of a group of records or other materials and to formally document their receipt. This helps maintain the chain of custody over the records required to maintain their authenticity over time. You must have a user account with sufficient edit permissions to access the accessions module of AtoM, such as an administrator or editor. For more information on types of users and edit permissions, see User roles. In the main menu located in the header bar, click the “Add” menu and select “Accession records” from the drop-down menu. AtoM takes you to an accession record edit page screen for data entry. If you have the Accession mask enabled, then the Accession number field will be automatically assigned a Unique ID based on the mask settings - for more information, see: Accession mask. If the mask setting is turned off, the field will be empty. Add a unique value to the Accession number field or make edits to the pre-populated one as needed. Administrators can turn the accession mask on or off, and alter the default accession mask and counter (from which the accession number is generated) by navigating to Admin > Settings > Accession mask. For more information, see: Accession mask and Enable accession mask in Settings - see also the example provided in the section on altering the accessions mask for legacy accessions, below. If you attempt to use a value for the Accession number that is not unique (i.e. is already in use by another accession record), AtoM will provide a warning, and will not allow the record to be saved until the Accession number is edited and a unique value is added. The accession record edit template provides a variety of field types for data entry (e.g., calendar, free-text, pop-up dialogs and drop-downs). Remember to click on each information area to access the data entry fields grouped under it. Enter data as required (further information on filling out specific parts of the accession record is included below). Click the “Create” button in the button block to create and save the new accession record. If you do not want to keep the record you can click the “Cancel” button and remove the record. In the Edit accession record screen, under the Donor/Transferring body area you can enter the names and contact information for related donors using the donor dialog. Click the “Add new” button to open the Donor dialog and add a new donor. 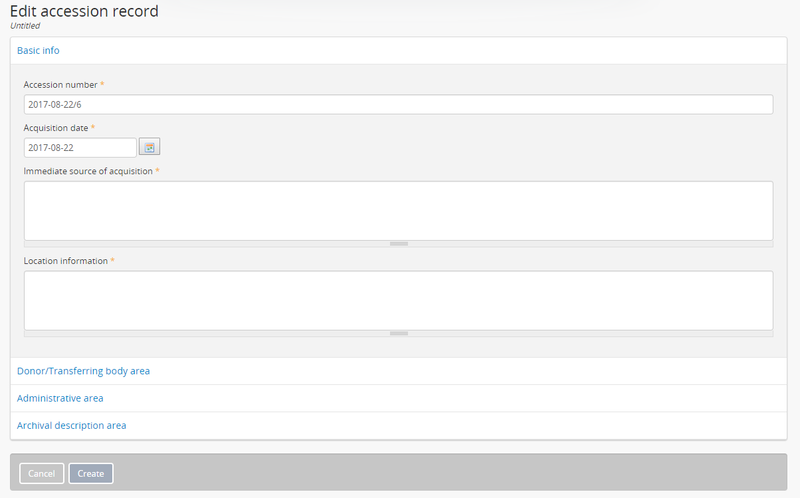 In the donor dialog that will pop-up, the Name field at the top of the dialog is an autocomplete field. To link to an existing donor record, begin typing the name of the related Donor into the Name field - as you type, matches will appear in a drop-down menu below the field and you can click on a name there to select it. Alternatively, you can create a new donor record by typing a new name, and completing the other related fields in the Donor dialog. Name - an autcomplete field where you can link to an existing donor record or enter a new name to create a new donor record. When new information is entered into the donor dialog, a new Donor record is created. 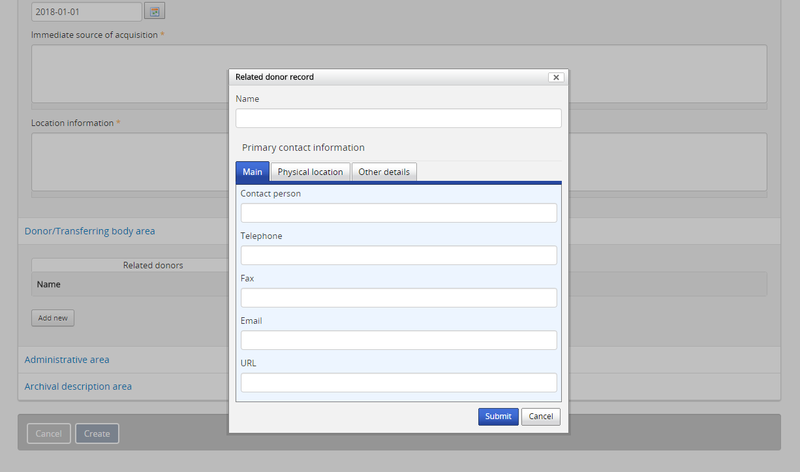 Alternatively, if you have selected an existing donor using the autcomplete values in the Name field, you can edit the existing contact information. Donor records can be accessed via the main menu by navigating to Manage > Donors. After an accession record is created, you may add a rights record to it by clicking “More” then “Create new rights in the button block. The rights entry page will appear. Multiple rights basis and granted rights can be added. For a full explanation of rights, go to the Rights page. Users have the option of linking a new accession record with an existing archival description in the AtoM database. The Archival description information area is located at the bottom of the accession record edit page. Placing the cursor in the data field will activate a drop-down list of all archival descriptions entered into the database. The User selects the appropriate archival description by moving through the list (a blue highlight will indicate which record you are selecting). Then Save the record by clicking “Save” in the button block at the bottom of the accession edit page. Users can link an accession record to a fonds/collection level archival description or lower levels of description including sous- fonds, series, sub-series, and files. You can link to multiple archival descriptions as needed by repeating the steps above. After creating an accession record, save your new data by clicking “Save” in the button block at the bottom of the accession record edit page (A user also has the option of clicking “Cancel”, but all data entered will be lost), you can review the data in the accession record view page. Notice that the linked archival description is now presented as a hyperlink in the accession record. Existing accession records can be upated at any time by a logged-in user with edit privileges. AtoM will redirect you to the accession record browse page. Select the record you want by clicking on the hyperlink Identifier. You can also search for an accession record with the accession records search box located at the bottom of the browse page. For more information on searching for accession records in AtoM, see: Searching for accession records. Archival descriptions that are created from an accession record will have a hyperlink to their related accession record. The hyperlink is located in the “Accession” information area at the bottom of the archival description view page. Logged-in users with permissions can select the hyperlink accession record identifier and AtoM will take them to the related accession record view page. Unauthenticated users (i.e. those who are not logged in) will not be able to see the Accessions area; logged-in Users without permissions can see the hyperlink but cannot access the accession record. Once you have selected an accession record, you will be redirected to the selected record’s view page. To enter edit mode, you can either click the “Edit” button in the button block at the bottom of the view page, or click on any of the information area headings in the accession record. The accession record will reload in edit mode. On loading, the edit page displays the record with all information areas closed; click on an information area to access the fields grouped under it. To discard all changes, click the “Cancel” button in the button block; AtoM returns you to the view page, with no changes saved. To save your changes, click the “Save” button in the button block. AtoM will reload the page in view mode, with all changes saved, so you can review your work. 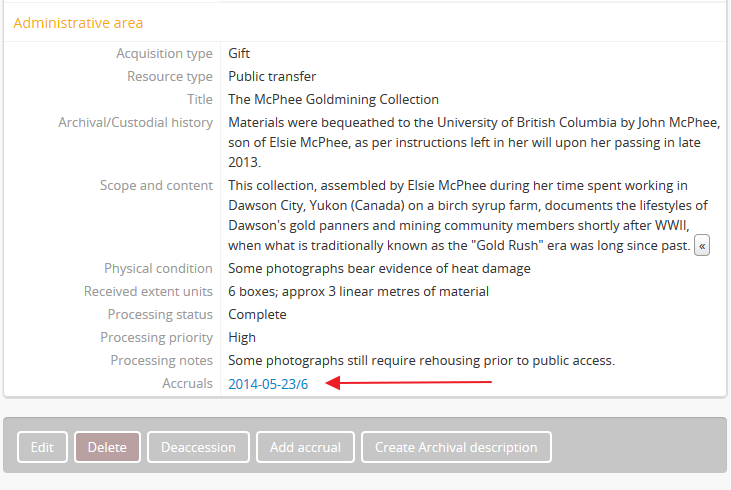 Navigate to the accession record to which you would like to add an accrual. Instructions on how to do so are outlined above in Edit an existing accession record. When you have selected the accession record, scroll to the bottom of the view page and click the “Add accrual” button in the button block. The edit template provided for the accrual is the same as that of a new accession record. Add data as required. See Add a new accession record above for more information on working with the accession record template. After completing the new accrual information in the edit page, click on “Create” in the button block at the bottom of the page. Your new data will be saved, and you will be redirected to a view page where you can review your work. When viewing the accession record for the accrual, you will notice that in the Administrative information area an “Accrual to” data field shows the related original accession record. The data is a hyperlink that can be clicked to navigate to the original accession record. Alternatively, if a User views the original accession record, in the Administrative area an “Accruals” data field shows the related accrual. An accrual cannot be added to an accrual - it must belong to the original accession record. Therefore, If a User views the accession record of an accrual, the “Add accrual” button is not available in the button block. If the accession record is an original however, the “Add accrual” button is available in the button block. There is no limit to how many accruals can be added to an original accession record. Users who have recently migrated to AtoM, or are catching up on a backlog of accessions, may need to add new accession records that have older dates encoded in the accession number. There are several ways this can be done in AtoM - however, the first two require that a user have administrator access to the application. AtoM offers administrators the ability to import data in multiple formats including CSV (comma separated value) import. Accession records can be imported via CSV using the Accession record CSV template provided for users on the AtoM wiki; further instructions are included on the CSV import page. The accessions CSV import method has no restrictions on the accession number formatting - consequently, users can import multiple legacy accession records at once using this method. Users interested in creating an accession record that has a legacy accession number associated with it via the AtoM user interface, can do so by first editing the Accessions mask in the Admin > Settings > Global area, and then creating a new accession record. By default, AtoM creates the accession record identifier as a unique number compiled from [YEAR MONTH DAY Incremental#] - this is denoted in the Global settings “Accession mask” as %Y-%m-%d/#i. A fixed value can be entered for any of the date variables (year, month, day) used in the accession mask, to create a number of legacy accessions from the same year and month, for example. These changes will stay in effect until an administrator returns to the global settings menu via Admin > Settings > Global and returns the Accession mask to the default setting. Don’t forget to do this, or all your new accessions will appear to be legacy accessions! The accessions mask is provided to help users apply consistent and unique identifiers to accessions. Users always have the ability to edit the pre-populated values provided by the accessions mask when creating a new accession record. However, when working with legacy accessions, it may be easier to simply disable the accessions mask, and manually populate the Accession number field. An administrator can do this via Admin > Settings - for more information, see: Accession mask and Enable accession mask in Settings. Note that, even with the Accessions mask disabled, AtoM will still attempt to enforce unique Accession number values. If you attempt to use a value for the Accession number that is not unique (i.e. is already in use by another accession record), AtoM will provide a warning, and will not allow the record to be saved until the Accession number is edited and a unique value is added. 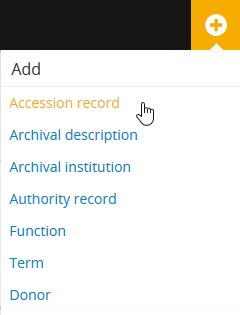 After you create a new accession record, you can create an archival description by clicking on the button “Create Archival description” in the button block. Archival descriptions can be generated from an accession record at any time; it does not have to be at the time of creation. To create an archival description from an existing accession record, follow the first steps outlined in Edit an existing accession record to browse existing accession records and select the one that you would like to use. Name access points (drawn from creators) and Rights added to the accession record are also inherited into the archival description. Scroll to the bottom of the accession record’s view page. Click the “Create archival description” button located in the button block. AtoM will generate an archival description using the fields listed above, and then will take you to the new description’s view page. You can see that the data you entered into the accession record fields: title, name of creator, archival/custodial history, scope & content and physical condition are all inherited into the archival description. If you added rights to the accession they are also inherited. The new archival description is saved as a draft record - the title of the new description is derived from the data entered into the title field of the originating accession record. The archival description can now be edited by clicking on the “Edit” button in the button block at the bottom of the description’s view page. For more information on editing an archival description, see: Edit an existing archival description. A link to the original accession record is maintained in the Accession information area in the archival description. Similarly, a link to the archival description is added to the related accession record. These are hyperlinks; clicking them in either record will take the user to the related record. Logged-in users with permissions can select the hyperlink accession record identifier and AtoM will take them to the related accession record view page. Unauthenticated users (i.e. those who are not logged in) will not be able to see the Accessions area in the archival description, and they will not be able to access the Accessions module; logged-in Users without permissions can see the hyperlink but cannot access the accession record. Navigate to the accession record you want to delete. You can locate all accessions in AtoM by clicking on “Manage” in the main menu (located in the AtoM header bar) and selecting “Accessions” from the drop-down menu. For more information on navigation in AtoM, see Access content. For more information on locating accession records in AtoM, see the Edit an existing accession record section above. Scroll to the bottom of the selected accession record’s view page, where the button block is located. If you choose to proceed and click “Confirm” the entire accession record will be permanently deleted. Clicking “Cancel” will return a user to the accession record view page. Instead of permanently deleting an accession record we recommend creating a deaccession record. This way all records created by the archival institution or repository can be preserved for future reference.